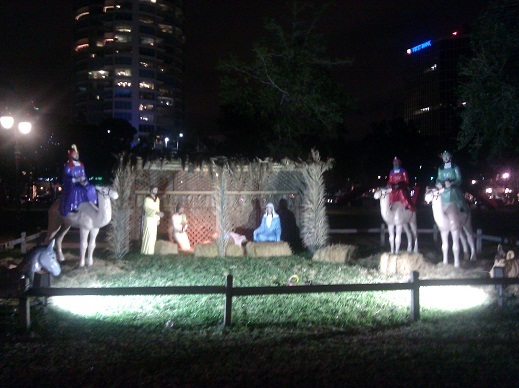 Of course we understand it is not really Jesus’ birthday. As Christians, we are just celebrating the life of Jesus, and taking advantage of the opportunity to share the Savior with the world, like we do every day when given the opportunity. I will never forget a true story my grandmother shared with me one cold Christmas season. She was outside her house, looking up a small hill, when she saw a little neighbor girl walking down the hill with her doll towards her house. It was freezing and starting to sleet, when the little girl stopped, took off her coat and wrapped the coat around her doll! The little girl then shivered the rest of the way towards her house, holding her doll close to her heart to keep her warm. My grandmother, and the rest of us were perplexed at the rationale of the girl. It was only a doll and could not feel anything. Maybe the little girl did not know the difference between pretend and reality. Even though it was apparently a foolish deed, I am sure Jesus perceived what was in the little girl’s heart, and the way Jesus looked at it, He was the little doll the girl was taking off her own coat for to keep warm! Of course I realize it was just a doll, but how much more it must warm the heart of Jesus when He sees us doing kind loving deeds for each other out of love all year long! The little girl in your story reminds me of my granddaughter. She gave me her prized sticker the other day. Thanks for a touching story.